After a long weekend, Eagles jumped right in Tuesday morning, with our morning launch and a socratic discussion about MLK, along with a run through of our week. In Launch Pad, we learned how to run a liquid chromatography, using leaves to understand why most plants are green and also change color in the fall. They also launched their Professional Perspectives Project, where they will be interviewing/shadowing/interning with professionals in various Biology fields that may interest them. Also be sure to ask your hero about the Life Curiosities challenge between the studios and what curious questions they have put up on their board! This week in Art, Foundation continued building the characters for our play, alongside some Navigator Eagles. They finished their drawings of their characters, along with a detailed description of their character’s personality. Everything from favorite hobbies, to their personal goals and motivations. They spent the rest of their time doing improv practice games. Ask your Eagle to challenge you to the question game, and see if they can stump you! Launch Pad put in work toward their dramatic arts performances and exposition pieces. Everyone laid out a detailed, personal schedule they will follow over the next two sessions, to lead them through self-guided art work time. Foundation progressed with their research in Writing Workshop, exploring how to search for the right question to explore interesting and fun information on their chosen topics. They are working to build their notes, to be fully prepared with information when they start writing! Navigator and Launchpad have started their Nobel Prize acceptance speeches. This week they finished their outlines and wrote the first 2 sections of their speeches- things are moving along! Our Foundation heroes began their Big History journey starting with the stars, and have now reached the emergence of HUMANS! We had an enthusiastic and exciting discussion about our Question of the Year: What does it mean to be human? The heroes asked many curious questions and shared some enlightening thoughts about how humans are unique and different. The Navigators and Launch Pad explored collective learning and how that makes humans different than other species. Our 8th graders and Launch Pad students are also continuing in their book The Beak of the Finch- a deep dive into evolution and Darwin. While we are still encouraging Eagles to submit PE pitches for new sports, we are continuing with Track and Field. This week we did some warm ups with different running drills, then split into two groups for a big run and some quick feet ladder work. We finished our time with some friendly competition, practicing our 50-yard dashes! Our good sports, elected by the Eagles, were Emi and Reese, for their hard work and positive attitude throughout! Over the course of this session, Foundation has gathered a couple times a week, to join for a read-aloud session led by one of the Guides. It has been incredible seeing our students so motivated to settle in and listen to the story, about a family and a rescued elephant, escaping bombers during WWII. It has been a great opportunity to grow in reading comprehension, and get everyone excited about following the story. Eagles were so eager to get through the book, that they requested we read through lunch until we finished it! We finished our week with Shell Shop, allowing our Eagles to spend the shells they’ve saved on a variety of fun things! Some chose to save their shells for the next shop, while others enjoyed buying things like emoji pillows, toy figurines, and balloons! 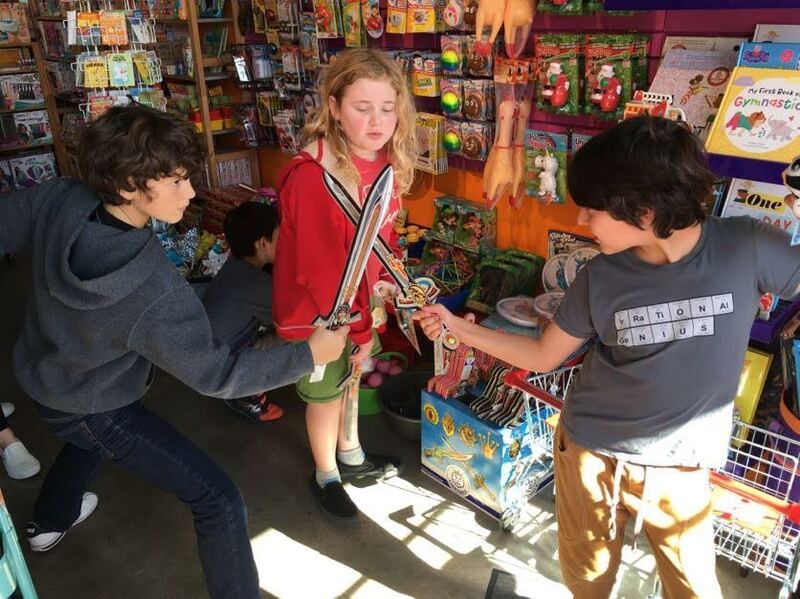 some of our Eagles also enjoyed Fun Friday, with a walk down the street to a local toy shop. A great ending to a solid week!